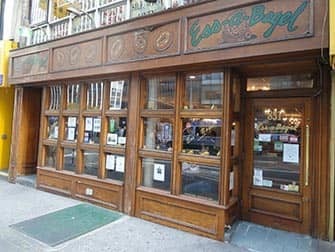 Visiting Ess-A-Bagel is an experience in itself. In the humongous display you’ll find dozens of bowls with salads, cream cheese and all kinds of fish. You see, this place is known for their awesome fillings as well as the fresher-than-fresh bagels. At some places the choice is often limited, here, you can really go all out. Something to try is the chicken curry salad: nice and spicy with tender pieces of chicken. Vegetarians can go all out with a variety of tofu based cream cheeses. 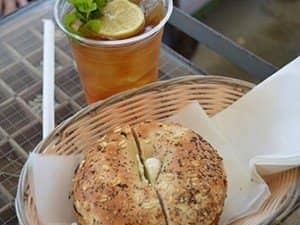 In addition to the fillings, choose from a variety of bagels – even toasted by the staff if you so wish. Your meal can be enjoyed in the spacious dining area, but do keep in mind that it can be busy, especially during lunch time. 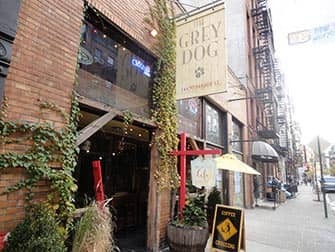 The Grey Dog has a number of different locations in New York, but the one in SoHo is ideal for when out shopping in the neighbourhood. It is also a great place to enjoy a cup of coffee, in addition to breakfast, lunch and dinner. 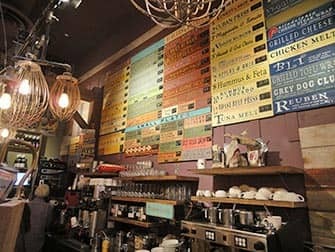 The menu above the bar has been nailed to coloured wooden planks on the wall. That way, when you are waiting (especially if it is busy) you can figure out what you want to eat or drink beforehand. They have a large coffee selection, available in hot or cold varieties. It’s not cheap, but you do get a huge cup of coffee or tea for your money. If you want to enjoy lunch or dinner at The Grey Dog, be sure to order a dish with their homemade fries. Eric’s Tip: The atmosphere at The Grey Dog is very relaxed. All locations have been quaintly decorated, they play good music and you’ll usually find a mixed but hip crowd. This has to be one of the cutest coffee shops in New York. Thanks to both the extremely friendly staff and the customers, the atmosphere is always lovely. The service is perfect: your cappuccino will be dusted with a coco heart and your order will be delivered to your table; even if you order at the bar. There is plenty of room to sit – downstairs or upstairs and there is free WiFi. Enjoy a wide range of coffees at Irving Farm, both iced or hot. There is a small vitrine of freshly baked muffins, brownies and chocolate croissants (recommended!). During the day you can also enjoy a small selection of sandwiches and bagels, and at night you can treat yourself to a cheese platter and wine. 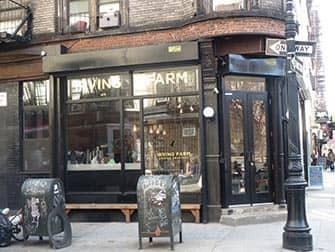 Mud is known in New York for their homemade coffee with a very high caffeine content. Perfect for ‘the city that never sleeps’ of course. You can order an original cup of Mud, but the Mud Mocha is also very good. No need for a caffeine boost? You can still be adventurous with an Almond Latte or a Mint Mochacinno, and not get the jitters. Because the coffee is strong, every table has a free bottle of water. There is also an elaborate menu with breakfast and brunch options. All the dishes have a South American influence. For something sweet you should check out the vitrine at the bar with a selection of delicious muffins. In the summer, the garden is open so you can enjoy your food outside. The only downside to Murray’s Bagels is that there is not a lot of room to sit down. But that’s about all. The bagels here are so good that they don’t even need filling. Try, for example, the ‘everything’ baked with poppy’s seeds, onion and garlic. Even if the bagels are divine, Murray’s also offers a broad range of fillings. Next to the classic cream cheese they have loads of salads and the staff know all about perfect fried eggs. The specialty here is smoked fish. That might sound a little weird, but once you’ve tried their smoked salmon you’ll be hooked! If you can’t choose, then their ‘specialty bagels’ are an option: filled with delicious combinations such as turkey, cheese, coleslaw and dressing. Want a cup of coffee on the side? The cappuccino here is very popular. Pick A Bagel is a chain with a number of branches in Manhattan. If I am close to one, I definitely pop in for a bagel. They have a huge range of bagels, cream cheeses and other toppings. 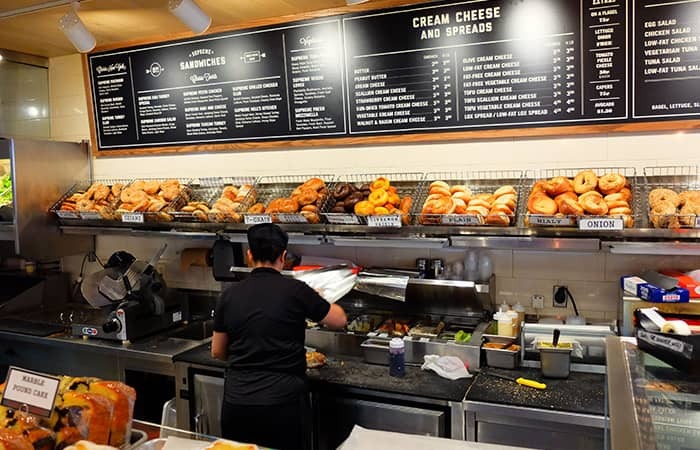 All Pick A Bagel locations also have a well stocked fresh salad bar, plus you can get all sorts of muffins, cookies and other sandwiches, like panini’s. The coffee here is also good.